Description: Although a stop must still be made to drop the helpers, Q-357 has begun its downhill journey to Connellsville. Description: Helpers pushing hard on the tail end of Q283 after the train stalled. Description: Q293 comes up out of the cut with older power on the point. 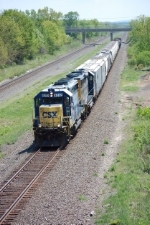 Description: CSX 6212, 5839, 7367 and 7543 lead Q293 out of Washington Cut. Description: B738-29 coming back from EPRY as the sun sets. Description: Passing the old Reading fright house. Description: 6212 sneaking his way through Moyer's Feed to Reliance Rd. Description: In the North Yard. Description: Q426 eastbound on track 1 @ CP 107. Description: Q436 roars east through West Springfield Yard at 3:53 with an increasingly rare pure-YN2 consist. Description: Railfans young and old on their way home from the Amherst Railway Society Train Show look on as Q436 rolls east through West Springfield Yard. Description: Local power parked at W. Springfield Yard. Title: A local heading west. Description: CSX Local 6212 heads out of the interchange.